A few Taipei 101 facts surprise people, but none more than the existence of Summit 101 -- a "secret" VIP club purported to exist on the 101st floor of the building. The Taipei 101 tower in Taipei, Taiwan, was the world's tallest building from 2004 until 2010 when it was beaten out by Dubai's impressive Burj Khalifa. Regardless, Taipei 101 is still considered the tallest green building in the world for its innovative and energy-saving design. Even the 2015-2016 New Year's Eve firework's show was nature themed. Rich with symbolism and tradition, Taipei's iconic landmark is a standing monument to ancient feng shui traditions and modern architecture. Before heading to Taiwan, read some Taipei travel essentials to know what to expect. Height: 1,667 feet (508 meters) as measured from the ground to the tip of the spire on top. Highest Occupied Floor: 1,437 feet (438 meters). Number of Floors: 101 (an additional five basement floors are underground). Outside Observation Deck: 91st floor. Construction Cost: US $1.8 billion. Even the neighborhood and sculptures in the park surrounding Taipei 101 are meant to support the tower's feng shui and to prevent positive energy from escaping. The park is round to reinforce the idea that the tower is a giant sundial. From the shape of entrances to curving surfaces and colors, the landmark is designed to symbolize prosperity and good fortune. To some onlookers, Taipei 101 looks like a stack of Western-style Chinese food carryout boxes (traditional oyster pails), however, the tower is meant to represent a stalk of bamboo reaching into the sky to connect heaven and earth. The 101 floors represent adding one to the number 100, which is considered perfect and auspicious in Chinese culture. In other words, even better than perfect! The eight sections of the tower are a nod to the auspicious number eight, which represents abundance and good fortune in Chinese culture. Because four is considered an unlucky number in superstition, having a 44th floor was purposely avoided by creating a floor 42a to bump the 43rd floor into that position. When it opened in 2004, the Taipei 101 tower beat the twin Petronas Towers in Kuala Lumpur, Malaysia, by a height of 184 feet for​ the title of "tallest building in the world." Although owned by the Taipei Financial Center Corporation, the tower is actually managed by a company based in Chicago, USA. Taipei 101 is symbolically boasted as the tallest sundial in the world; the circle-shaped park around the tower adds to the effect. There are 61 elevators inside of the tower. Each elevator has atmospheric controls to keep passengers' ears from popping. The two fastest elevators inside Taipei 101 moves at an astonishing speed of 37.7 miles per hour (55.2 feet per second); they were once the fastest in the world. Reaching the 89th floor from ground level only takes around 44 seconds! French climber Alain Robert, nicknamed the "French Spider-Man," climbed Taipei 101 legally on Christmas Day in 2004. He had already climbed the Eiffel Tower, Empire State Building, and many of the world's tallest structures; the climb took four hours to complete. Austrian Felix Baumgartner, best known for breaking the sound barrier during his 2012 space jump, did an illegal base jump from Taipei 101's outside observation deck on the 91st floor in 2007. The parking area in the basement of Taipei 101 is 893,000 square feet (82,962 square meters) and can accommodate more than 1,800 vehicles -- don't forget where you parked! Taipei 101 cycles through seven different colors (each with symbolic meaning) with a new color for each day of the week. Construction on the Taipei 101 tower began in 1999 after two years of planning; work concluded in 2004. The ground-breaking ceremony was held on January 13, 1999, and the tower opened to the public on December 31, 2004. Construction was delayed for only a week during a catastrophic earthquake in 2002 that caused five deaths at the site after a construction crane plummeted to the street below. Taipei 101 surpassed Malaysia's iconic Petronas Towers to grab the title of "tallest inhabited skyscraper." At the same time, the tower took the record for "highest inhabited floor" from the Willis Tower (formerly known as the Sears Tower) in Chicago. The chief architect for Taipei 101 was Chinese-born C.Y. Lee; he received his master's degree from Princeton University in New Jersey, USA. To survive potentially destructive forces of nature, Taipei 101 incorporates a steel pendulum -- the largest and heaviest damper in the world -- suspended through the core of the building between the 92nd and 87th floors of the structure. The suspended sphere weighs 1.76 million pounds (725,749 kilograms) and sways freely to offset the movement of the building itself. Visitors can see the aesthetically shaped pendulum in action from a restaurant and the observation decks. The anti-sway system passed a real-life test during Taiwan's 6.8-magnitude earthquake in 2002 while the tower was still under construction. What Is Inside the Taipei 101 Tower? Taipei 101 is home to scores of tenants including communications companies, banks, motor companies, consulting groups, and financial companies. Some notable tenants include Google Taiwan on the 73rd floor, L'Oreal' -- the world's largest cosmetic company, and the Taiwan Stock Exchange. The tower is also home to a library, fitness center, a shopping mall with over 828,000 square feet of shops, and all the expected retail and restaurant chains. 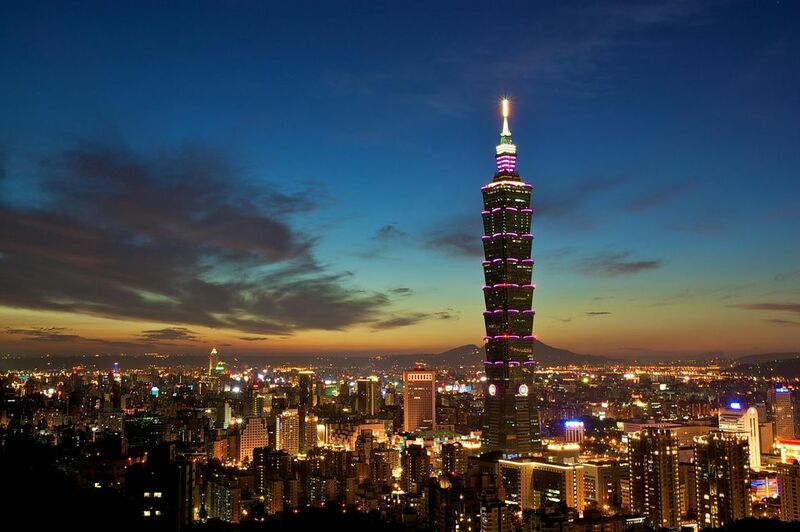 Taipei 101 has two indoor observatories (88th and 89th floor) that provide 360-degree views of Taipei. Stairs go up to the 91st floor outside observation deck which is open when weather permits. The record-breaking wind damper can be viewed from the indoor observatories. Food, drinks, souvenirs, and voice tours are available for purchase. Tickets are available at the entrance located in the mall on the 5th floor. Ticket sales stop at 9:15 p.m. Adult entrance for indoor decks: NT $500 (around US $15). Outdoor observation deck (only open when weather permits) requires separate ticket purchase. Appropriate dress and footwear are required to visit Taipei 101's observatories -- don't wear flip-flops! Perhaps most interesting of Taipei 101's inhabitants is Summit 101 -- a secretive, exclusive VIP club purported to exist on the 101st floor of the tower. Aside from once being listed in the tower brochure, the club is shrouded in secrecy and is unreachable via the regular elevators. Despite widespread publicity and millions of visitors a year that come to see the tower, no one is really sure what goes on up there! The irony is that millions of people from around the world stare at the top of the tower on New Year's Eve as Taipei 101's spectacular fireworks shows are broadcasted internationally. Only in 2014 was a TV film crew finally allowed inside of the Summit 101 club; its existence was publicly acknowledged. Rumor has it that only foreign dignitaries, special VIPs, and people who spend a hefty sum in the mall are invited to the top for the best view of the city. The 101st floor is divided into different sections, so speculation still exists that the public hasn't seen all that there is to know about the secret floor.